This is a chulah, the basic cooking stove in rural India. It is fueled with dung, fuelwood, and trash. It is estimated that over 100 million households use these stoves to prepare their meals 2 – 3 times a day, every single day. As you can imagine, it is a major source of air pollution in India. For the families that live in this environment they are subjected to air pollutants at concentrations 5 times higher than coal. Due to poor rural highways and limited energy generation infrastructure this is their only choice. What if every community had a biochar system in place, where they could create their own biochar charcoal? 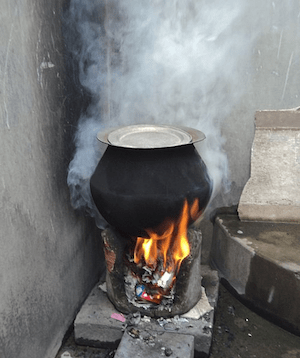 How much would it cost to set up a clean cooking fuel program? How many lives would be saved by removing this known health hazard? How much cleaner would the air in India be? Seems to me that this would be a priority for a government that is trying to combat global warming and environmental issues, a way to help the people and reduce pollution at the same time. Making biochar is easy, inexpensive, and will hopefully one day replace open field burning of crop waste. Turning that biochar into cooking charcoal would provide these families a smoke-free cooking fuel that is cheap, burns hotter and lasts long.